Research into the physiologic effects of low power, pulsed electromagnetic (EM) fields, has produced a number of important discoveries. To date, with rare exception, these discoveries at best are investigational, and have not been applied in a clinical manner. Much of this research material is unknown to the general practitioner, and has not been correlated into a potentially utilizable treatment method. This paper proposes the fusion of existing cancer chemotherapy techniques with low power pulsed EM field research discoveries. Evidence is presented that the sum of these combined effects far exceeds that of each method individually. A transmitted, pulsed EM field, can be created which will safely produce whole body permeation/saturation. Such saturation can create an interaction of the pulsed EM field with chemotherapeutic medications, simultaneously, at all tumor sites throughout the body. By creating a synergism of biochemical, electrochemical , and electronic principles, the practitioner should be able to achieve a superior treatment outcome. Present chemotherapy regimens are fraught with many shortcomings. The worst of these is toxicity , which can include permanent damage to various vital organs including the heart, lungs and kidneys. Even without such permanent damage, short term toxicity manifests as severe nausea, repression of the hematopoietic system, alopecia, and many other types of physical unpleasantness. Other major problems with chemotherapy are development of cellular accommodation ( non responsive/refractory to treatment), patient/family mental stress, and in many cases no clear cut outcome other than temporary tumor shrinkage. Actual prolongation of patient survival post treatment is all too often a secondary consideration in the application of chemotherapy. The great majority of cancer research is directed not to a solution of the these problems, but rather towards a solution to cancer. For patients, the only reason they consent to such abusive treatment, is that the consequences of untreated cancer outweigh the negative repercussions of treatment. What is needed is a new chemotherapeutic medication which will selectively affect cancer cells, and has minimal side effects/toxicity. This medication would also have improved outcomes from treatment, and be highly resistant to cellular accommodation . Primary importance would be directed to improved patient survival percentages and overall length of survival. Such a medication does not now apparently exist, and next to an outright cure, could be considered as the “Holy Grail “ of cancer treatment. It is the contention of this paper that it may be possible to adapt at least a few of the presently utilized chemotherapeutic medications, to a new treatment protocol. A protocol that will produce the effects that meet this idealized vision of cancer treatment. This transformation of available chemotherapeutic medications and treatment is to be accomplished via a synergistic combination of the medication with a low voltage and low current, transmitted pulsed electromagnetic (EM) field. The ideal transmitted EM field is one that can couple itself energetically to the entire body. That is, the field may be used to treat the entire body at one time. This will ensure that wherever the medication can be delivered within the body, treatment congruence between the field and the medication will occur. There is considerable scientific supporting evidence for this proposal that will be discussed in the following paragraphs. The utilization of electrical pulses with chemotherapy medications is not new. This technique is being investigated and employed by a variety of researchers and cancer treatment specialists. The primary method utilized is some variant of what is known as electropermeabilization or as it is also known, electroporation. An ultra short time duration, but high intensity, electrical pulse , is applied to a tumor or group of cells to produce short duration and reversible pores within the plasma membrane. Pores through which various ions and molecules may be introduced into the interior of the cell. To use this technique, a tumor site is saturated with a chemotherapy drug and then pulsed through implanted electrodes with a very short and very intense electrical signal. An associated technique being utilized by some clinicians and researchers is known as EChT or Electro Chemical Treatment of tumors. In this method electrodes are inserted into the cancer site along with a chemotherapeutic medication. In contrast to electropermeabilization, relatively low currents and voltages are used on the tumor site. 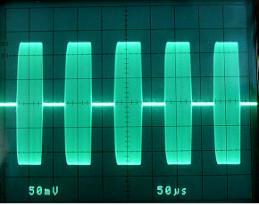 These voltages and currents may be applied for many hours at a time. The migration of charged particles in the created field is somewhat akin to electrophoresis and has produced some excellent responses to treatment. 1. The techniques can only be used on specific localized tumors. 2. The patient must endure the implantation of electrodes and direct injection of the chemotherapy medication. Often deep within the body. extremely small tumors. This allows small metastatic sites to escape treatment. 4. Some tissues do not tolerate the direct application of chemotherapeutic medications, and there may be collateral damage to healthy tissue. 5. With EChT, there is also metallic ion migration off the electrodes into the surrounding tissues. This can create localized areas of metal toxicity. 6. The patient must endure the bursts of electrical current into their body from either EChT or electropermeabilization. In EChT, the electricity is much akin to that delivered by a muscle stimulator. An electropermeabilization pulse is more akin to the spark derived from an automotive ignition coil. To use a more graphic example of what a patient experiences, imagine having a muscle stimulator or car ignition coil attached directly to your colon. In defense of electropermeabilization and EChT, both methods overcome some major problems in traditional oral or IV chemotherapy. Through direct injection into a tumor, the medication can be concentrated at the site of the tumor without creating whole body toxicity. Electropermeabilization and EChT offer a method to increase drug delivery into the cancer cells, which has brought about some very significant responses to treatment. Further, the amount of medication necessary to produce a toxic response within the cancer cells, is at times, significantly reduced. EChT and Electropermeabilization are not the methods to be utilized in this proposal . They have been discussed only to demonstrate that there are existing synergies between electrical fields and chemotherapeutic medications. The human body ( or for that matter any mammals body) is very complex electrically . Each cell within the body has a particular set of electrical parameters within which it functions. The cells of the body operate and maintain their homeostasis at least partially through electro chemical processes. Electrically charged particles such as ions, and proteins, accumulate on both sides of the various membrane interfaces of a cell, and create an electrical potential. Normal cells and cancer cells have many different physiologic qualities, which include those of their plasma membrane potential and electrochemistry. A normal cell has a plasma membrane potential of about 70 to 100 mv (Cone, 1970, 1975, 1985). This is equal to an electrical potential of between 10 and 20 million volts per meter ( Brown, 1999). The mitochondrial membranes of a normal cell maintain an electrical potential of almost 40 million volts per meter (Brown, 1999). When a cell becomes cancerous, plasma membranes degenerate and depolarize ( Marino et. al. 1994 ) .More succinctly, the electrical potential across the membrane drops drastically. The degeneration and loss of electrical potential of the plasma membrane in cancer allows it to become more permeable to water, and to certain ions such as sodium that normally are found in abundance on the outside of a normal cell. In cancer, sodium is allowed through the cells plasma membrane and accumulates within the cytosol. Meanwhile the ionic elements of potassium, magnesium , calcium, and zinc, which are normally found inside of the cell plasma membrane, tend to migrate out of the cytosol (Seeger and Wolz, 1990). As the distribution of ions shift, cancer cells tend to become very electronegative, and the tissue areas surrounding the cancer cells become quite electropositive. 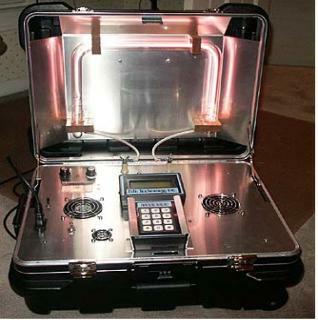 This electropositivity has been used for detection of cancer (Marino, et. al, 1994). The combined effects of the low plasma membrane electrical potential and ionic imbalance, assists in the conversion of a normal cells aerobic based metabolism to that of a cancer cell with an anaerobic based metabolism. Conversion to anaerobic glycolysis (fermentation) as a primary mechanism for energy production results in excessive accumulation of organic acids and acidic pH alterations in cancerous tissues (Seeger and Wolz, 1990). The loss of electrical potential across a cancer cells plasma membrane is the foundation upon which this proposal is based. The application of an artificially created electrical field of a few tens of millivolts at the plasma membrane of a cancer cell will create an electrochemical imbalance of the cell. An imbalance which this proposal intends to exploit. Ions and molecules ( chemotherapy medications) enter cells through a variety of different methods. These methods include ion gating, osmosis, and endocytosis. In a normal cell, these mechanisms are all driven by cellular energetic pathways. Ion Gating and Osmotic methods are capable of only passing small ions through the cell plasma membrane. Endocytosis, can pass large macromolecules such as sugars, and most importantly medications. These three methods of transport can be artificially mediated and elicited by the presence of an external pulsed electrical field. (Teissie and Tsong 1981, Petrov and Mircevova, 1986 , Rosemberg and Korenstein ,1997 ) When so accomplished they are known as Voltage Dependent Ion Gating, Electro Osmosis, and Electro Endocytosis. By inducing these electrically driven methods of transport, pulsed electrical fields are capable of producing disruption of the cancer cells electro chemical balance and function ( Panagopoulos, Karabarbounis and Margaritis, 2002). Electro endocytosis is of significant interest to this proposal. Endocytosis is a process whereby the cell plasma membrane invaginates and surrounds a large macro molecule. This piece of plasma membrane then closes off to form a vesicle which transports the molecule within the cell. The reverse process is known as exocytosis, whereby the empty vesicle is transported back to the plasma membrane. The vesicle then opens, and rejoins the plasma membrane. The process of endocytosis must be balanced to some degree with the process of exocytosis. If an extreme excess of endocytosis in relation to exocytosis occurs, a possible compromise of the cells plasma membrane may ensue. It is well known that at very high electrical field strengths, a process known as vesicle electroformation occurs. This process can create extremely large or macro size vesicles out of bilayer lipid membranes. A high electrical field strength dependent process is not the mechanism this proposal seeks to utilize. Rosemberg and Korenstein ( 1997) have shown that the process of electro endocytosis can occur at very low field strengths. They found it possible to incorporate molecules in the 1-2000 kD range into 85% of the cells used in their test. Other researches have supported this finding. The necessary field strength can be as low as 20 V/cm or a transmembrane potential of 6mv ( Teissie & Tsong, 1981). Electrically polar and nonpolar chemotherapeutic molecules have been utilized with very low electrical field strengths to produce highly significant positive treatment outcomes. Entin, et. al. (2003) , used fields of 40V/cm (12 mv added transmembrane potential ) with Bleomycin, Taxol , and Cisplatin in treatment of mice inoculated with melanoma cells. A low voltage enhancement was also reported by Miyazaki, et. al. (2003). Mice inoculated with Colon cancer cells were given intratumor injections of Bleomycin and exposed to fields of from 50 to 150V/cm . The use of chemotherapeutic medications with electrical fields can result in enhanced cellular sensitivity to the medication. Gray , et. al. (2000) found severe over dosage reactions to Adriamycin (ADM) occurred when ADM was administered to animals kept in a static but very intense electrical field . Cisplatin and it’s immediate family of molecules acts directly upon DNA. It has been used successfully in the combined treatment of B-16 melanoma bearing mice with low ( 20-100V/cm) field strength ( Entin et. al., 2003). It seems apparent that not only will the presence of cis-platinum type molecules within a cancer cell be advantageous, but so would a simultaneous stimulation of the activity level of the cells DNA. Cancer cells go through periods of rest and activity and most chemotherapeutic drugs are primarily effective against rapidly dividing cells. Application of chemotherapeutic medications is often timed to a perceived interval of genetic/cellular activity. The usage of low voltage pulsed fields seems to create an artificial “window” of activity. Low voltage pulsed electrical fields act not just upon the ability of a cell to aid molecular & ionic transport, they also act upon the cells DNA. Binderman, et. al. (1985) found that at between 13 to 50 V/cm , cell cultures of skeletal origin would immediately show changes in cyclic AMP levels and enhanced DNA synthesis . Blank and Soo ( 1997 ) reported a frequency dependent effect on Na, K-ATPase enzyme activation in fields of from 3- 3000 Hz. Pulsed EM fields have been linked not just to enzyme reactions but also to increased transcription rates for specific genes. Pulsed EM fields act directly on signal transduction pathways and with electrons in DNA to stimulate biosynthesis ( Goodman and Blank 2002). Chemotherapy cellular resistance is the most common cause of treatment failure and has several different etiologies. The most ubiquitous method of resistance to treatment is that of activation and expression of energy dependent transporters that literally remove the medications from the cells ( Gottesman 2002). The medication, due to the action of transporters, is not allowed to accumulate to a toxic level and cannot perform it’s assigned task. Even though small amounts of chemotherapeutic drugs do enter resistant cancer cells, the drugs biochemical action is thwarted. It is thought that the primary action of chemotherapeutic drugs is the initiation of apoptosis. Apoptosis is at least partially mediated by the behavior and chemical signals produced by the mitochondria. The mitochondria of malignant cells are electrochemically different from those of normal cells. This electrochemical difference acts to block mitochondrial response to the medication, and thwarts the apoptotic cascade. The plasma membrane potential of mitochondria in cancers cells has been found to be elevated, in one case it was approximately 60 mv higher than that of control epithelial cells ( Modica-Napolitano and Aprille 1987 ). Elevated mitochondrial membrane potential coincides with Cisplatin resistance in some cancer cell lines ( Dorward and Singh 1996). The high transmembrane potentials of mitochondria are created by a relative electropositivity of the outer membrane and a high negativity of the inner membrane ( Johnson , et. al. 1981). Mitochondrial based apoptotic mechanisms require that the plasma membranes of mitochondria depolarize, resulting in diminution of the transmembrane potential ( Mayer and Oberbauer 2003). Due to their elevated electropotential, mitochondria of cancer cells are going to have to undergo a much greater fall in electrical potential than a normal cell to initiate apoptosis. Further, formation of mitochondrial permeability transition pores ( a key factor in the initiation of mitochondrial based apoptosis) is inhibited as pH decreases (Nicolli , et. al. 1994). There are other inhibitors of treatment response within cancer cells. The majority of solid tumors show some if not total resistance to chemotherapy. This resistance is mediated by a local stress response to the microenvironment. When solid tumors are subjected to local conditions of hypoxia, acidic pH and low levels of glucose they react by stopping division. When cell division is arrested in this manner, chemotherapeutic medications become ineffective, that is they fail to induce apoptosis. ( Tomida and Tsuruo 1999 ). In summary, cancer cells are at least partially self protected against chemotherapy initiation of apoptosis through their electrochemistry. Correction of cellular stress factors, inhibition of intercellular drug transporter mechanisms, excess acid production, and excess mitochondrial membrane potentials, may be possible through the application of external pulsed EM fields. To clarify, the presence of pulsed EM fields may inhibit many of the undesirable cellular metabolic responses of cancer cells to hypoxia. These responses include; generation of hsp70, inhibition of expression of HIF1, diminish the production of angiogenic proteins, initiation of an anti cancer immune response, and possibly inhibit the activity of the FAS to reduce cellular growth rates. This proposed outcome from the use of pulsed EM fields to inhibit angiogenesis and tumor growth is supported in the literature. Pulsed EM fields were found to inhibit tumor growth with a reduction in the extent of vascularization and increased areas of tumor necrosis compared to controls ( Williams, et. al. 2001). In a cancer cell, Na+ ions accumulate inside the cell and K+ ions accumulate outside the cell. Modification and reversal of the local ionic concentrations and can be created by an external AC field. ( Teissie and Tsong 1981). Further , elevated pHi will increase the delta pH across the plasma membrane. It has been found that as a Multi Drug Resistant (MDR) protein is expressed, the delta psi or plasma membrane potential decreases ( Roepe, et. al. 1993). The presence of a pulsed field will circumvent the fall in plasma membrane potential. The energy within a pulsed EM field is capable of being absorbed by plasma membranes at least partially through the process of electro conformational coupling (Tsong,, et. al.,1989) Once absorbed, this energy may be converted to the chemical bond energy of ATP or to the potential energy of concentration gradients ( Tsong, et. al., 1989, Timashev 1981) . EM pulse responses of cellular membrane systems are frequency dependent. This response has been shown in several membrane enzyme systems ( Markin and Tsong 1991, Luchian, et. al., 2002, Ruiz-Gomez, et.al., 2002, Gluck et.al. 2001). Frequencies can also be utilized to affect cell division and growth. Kirson et al.,2004 ,found that low intensity frequencies in the 100 KHz to 300 KHz produced an inhibitory effect on a variety of human and rodent cell tumor lines. This effect was non thermal, and acted through both arrest of cell division and destruction of cells undergoing division. Movement of ions and molecules across the mitochondrial membranes is normally accomplished by a chemiosmotic mechanism that is free electron dependent. It is possible that the presence of a pulsed field could supplement, drive, or supplant this mechanism and affect the electropotential gradient of mitochondria. This may result in a diminution of the outer membranes electropositivity, allowing the Voltage Dependent Anion Channels ( VDAC) to open. As the electropotential of the mitochondrial membranes become depolarized the probability of Mitochondrial Permeability Transition Pore ( MPTP ) formation increases. (Petronilli, et. al., 1994). Formation of MPTP’s is a necessary precursor to the initiation of mitochondrial based apoptotic mechanisms. Similar pulsed fields gradients should act to inhibit the expulsion of drug molecules from the cell. The transporters will have to work against an artificially created concentration gradient that seeks to actively bring ions and molecules into the cell. From a practitioners viewpoint any instrument that might generate a pulsed EM field must conform to several criteria. Primarily, the device must be safe for the patient, and application must be consistent from patient to patient. Secondarily the device must be easy for the practitioner to utilize. Presently, there is not such a clinical device approved for use by the US FDA. Countries such as Canada have approved pulsed EM field devices that meet this criteria. Below is a picture of a type of device that will produce the necessary non thermal pulsed EM field. A variant of this instrument is presently approved by Health Canada as a transmitted field TENS device for the control of pain. Effective range is approximately 6 meters, typical treatment distance of the patient from the device is 2 meters. 300 Watt PEP pulsed field transmitter. 27.125 MHz carrier frequency. Pulse rate capability 225 KHz. It is the hypothesis of this paper that the totality of these effects will be enhanced transport of chemotherapeutic medications into the cells, retention of the medications to achieve high concentration levels, and increased responsiveness to the utilized medication . As the concentration of the medication increases in conjunction with the pulsed field altered cancer cell metabolism, apoptotic effects should become predominant. Transmitted pulsed EM fields when used in conjunction with chemotherapeutic medications will; decrease the treatment dosage substantially, produce an enhanced response to treatment, and have minimal to no toxic side effects. Work. New York, NY: The Free Press, 1999.
malignant mitogenesis. Ann NY Acad Sci 1975;238:420-35. Cells. Boca Raton, Florida: CRC Press, 1985. Against the Causes. Gesamtherstellung: Neuwieder Verlagsgesellschaft mbH,1990.